Jamie B. tagged me in this W.I.P. Hop, and I figured it was best to play along because she has a manuscript of mine and I kind of wanted it to be edited, not eaten. Just kidding! I love the chance to talk about the things I am working on because I am excited about them and it's a great way to build buzz for future releases. Answer the ten questions about your current WIP (Work In Progress) on your blog. What genre does your book fall under? Dark paranormal romance. Which actors would you choose to play your characters in a movie rendition? She is a bit old but I'd have Jayne Wisener as lovely Lena (she played Joanna in Sweeney Todd) She is exactly what I think Lena looks like. For Alex I'd pick Logan Lerman. 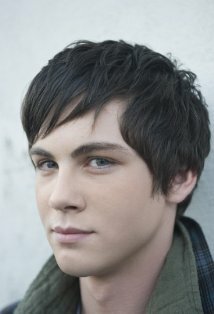 (Percy Jackson) He has the look, even if that movie book rendition was IMO awful lol. What is the one-sentence synopsis of your book? I just finished it this weekend so I haven't really thought about it. Let's go with. Love can live lifetimes, bone deep. How long did it take you to write the first draft of your manuscript? 2.5 fever induced days. Don't ask. What other books would you compare this story to within your genre? Would it be cheating to compare it to the other books in the series? I guess so. The series tends, as a whole, to be darker and moodier than most other paranormal romance books out there. It is not a horror book--but if you were to say, let Tim Burton do-over Twilight then perhaps The Hollows Series would be as dark and as whimsical as that. With less scrabooking herpes encrusted vamps and more Corpse Bride. Who or What inspired you to write this book? You know, there was one person who reviewed Skeleton Lake--and I am sorry I don't recall who off the top of my head; who said they were TEAM ALEX and I got thinking. I am pretty team Alex too. What else about your book might pique the reader’s interest? Sometimes it's nice to read about love when it's not so complicated. This is a book where even though the world is a mess the characters make love look easy.